We're beginning to track the warm-up expected this week. You can play along at home and review our spreadsheet with the progressive forecasts for each forecaster here. The Strib seems a bit more bullish on the warm-up for Tuesday and Wednesday than other weather outlets. Last night's snow provided a fresh canvas at TMF headquarters. Also, if we can sensitively play "The Japanese Forecaster" for a moment, it's interesting to note that the earthquake was not in a location that was considered as favorable for "the big one" as other places in Japan. Here's an interesting article from the Washington Post that discusses how the earthquake left scientists humbled at the unpredictability of it all. 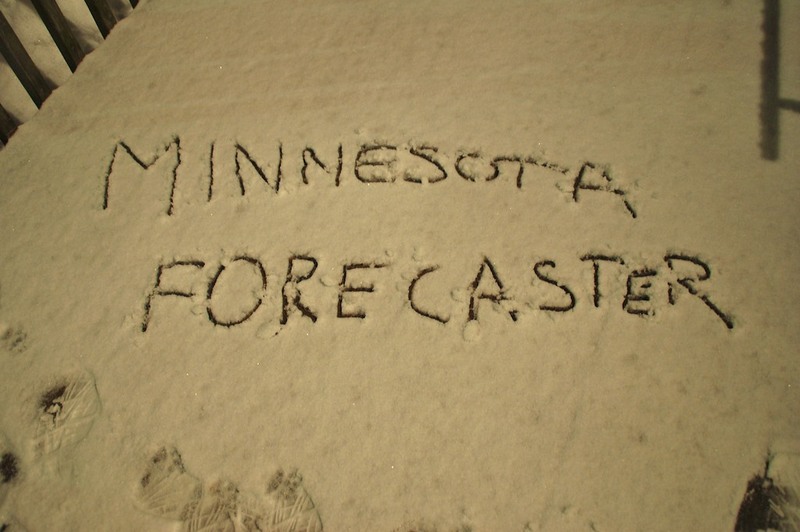 And you thought Midwestern snowstorms were challenging to predict! Not only am I seeing the warmup with high temps below freezing largely behind us, but the GFS is hinting at a couple waves of precip Sunday the 20th and Monday the 21st, and again Thursday the 24th through Sunday the 27th. The snow melt and the added precip as me a bit concerned with the severity of spring flood potential. A couple of those warm ups in the "beyond" part are due to westerly tracks of those systems bringing that precip. Those systems go away or shift, and it may not get as warm as we would like. Plus keep in mind there is still some snow pack out there, which will cool that warm air somewhat. Still, things are looking up temperature wise, but rain or snow, the pattern isn't looking good for those hoping for a slow, steady melt with no precip. You know, I am noticing a pattern with the weather. When looking at GFS PRECIPTYPE, I see that there is a pinwheeling low pressure off the Pacific coast almost constantly. When the color of it is mostly green-indicating rain, there tends to be warmer weather here, a little later. When it is blue (snow), there tends to be colder weather a little later. It also seems to have a relationship with the seasons. Looking about a week out,some models show the potential for snow near the metro,you seeing the same thing?,any chance we add to our snowfall totals or is winter done and I should buy some fertizler. Is that snow or just a lot of rain? I assume your talking about the Monday through Wednesday time frame. It seems you have three choices. 1) don't put away your snow blower. 3) my favorite, the cold comes in 24-36 hours earlier than the models show and the storm track goes to our south. ahhh, tis the season for wild, ever changing model data. Typical during the transition of the seasons, models probably won't get a good handle on things until a day or two before. GFS has snow next week, Euro has rain. Neither is good for the flood outlook, but I think some will agree that late this weekend through the next week or so are looking active. Don't count on models agreeing on much until, like I said, a day or two before the event. 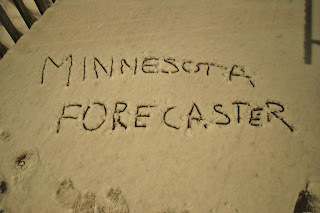 Thanks randyinchamplin for the update,so when you say favorite your hoping for one last hurrah from old man winter? The nao is tanking early next week and 850mb temps are cooling to support frozen precip,now all we need is a favorable track,nws also hinted at the possibility of mainly snow tues/wed timeframe in their discussion. One a side note does anyone follow the accuweather website(www.accuweather.com),type in Minneapolis for city and then follow the extended forecast,goes out 15 days,reason I bring this up is it is exactly the same 15 day that the startribune uses,so all those who give PD crap for his blog and 15 not matching that's why,he doesn't do the 15 day forecast,which is highly inaccurate anyway and changes every three hours. Most people who give PD crap do so because of his hyperbolic vocabulary, not his long range forecast. And, he deserves it! !